In terms of artistic sea changes, few are as profound as the sonic evolution of Preoccupations. The band emerged from the ashes of Women, a rather remarkable Canadian indie group from the aughts. 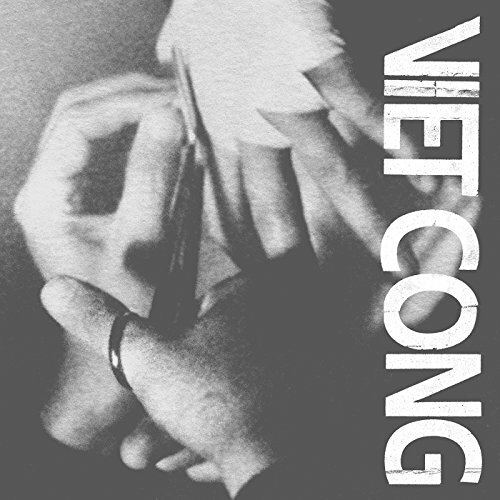 The first Preoccupations album, recorded under the Viet Cong moniker, garnered both critical acclaim and a lot of preoccupied attention to their rather tasteless band name. In response, the band changed their name in advance of their second LP, Preoccupations, to Preoccupations. Though less controversial than its predecessor, Preoccupations is easily one of the best records of 2016 and set a high bar for the band’s third album. The noisy, post-punk, snarl of Viet Cong transitioned into an intense darkwave vibe on Preoccupations and now, on New Material, the band has finally settled into making fully-formed songs offering a broader sound palette and deeper emotional range. New Material’s opener, “Espionage” pours-out layer-upon-layer of 80’s synth-pop glory to quickly create a deep river of sounds reminiscent of The Cure, New Order and Gary Numan with some slight flourishes Giorgio Moroder-esque to boot. Matt Flegel’s affected vocals, now reminiscent of Peter Murphy, lock-in nicely with Matt Wallace’s outsized-yet-flat drum sound. The guitars at first crunch and then soar their way across and then above the tense track. The layering of the sounds helps to create an uncomfortable thrum that underpins the whole song in an increasingly aggressive manner. As an opening salvo, “Espionage” shows Preoccupations have transitioned into a much tighter unit than ever before. “Decompose” opens with some lovely vocal harmonizing and then launches into a repetitive, rocket-paced, synth journey to the farthest reaches of space. It’s reminiscent of “Crosseyed and Painless” but cleaner and more futuristic. “Disarray,” with its shimmering, Bauhaus-meets-The Cure sound and “Antidote” which sounds like the best Chameleons song you’ve never heard, might be the two most uplifting songs the band has recorded to date. “Antidote” in particular becomes New Material’s centerpiece and, despite its thundering drums and the growl in Flegel’s vocals, offers a glimmer of hope for listeners that not all is lost if they can learn to accept the nobility of defeat. New Material is the first non-self-titled album the band has ever released and the newness it projects has seeped into everything Preoccupations touches here. The new cohesion, the new sound and new hope present on the record are all welcome additions. Preoccupations has always been a “band to watch” but never quite lived up to the hype... until now.